Did you enjoy this chapter? Most everyone likes Christmas. Harry seems to have rather enjoyed this holiday at Hogwarts. However, this chapter isn’t only about Christmas. It’s also about Harry’s discovery of the Mirror of Erised and his feelings for the family that he has never seen. 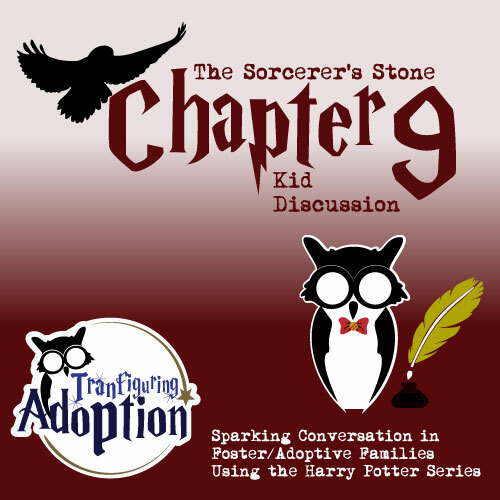 Before we get into my adopted kids’ thoughts about this chapter, I want you to talk/think about a few questions. Why did Harry enjoy Christmas so much? How do you know he was having fun? How do you know Harry was having fun? How was Harry feeling when he found the mirror and saw his family? If Harry was having so much fun at Christmas, why did he seem so gloomy toward the end of the chapter? My kids could relate with the sweaters that the Weasleys and Harry received as gifts. We don’t give everyone sweaters at Christmas BUT for them the sweaters were a Christmas tradition. We try to have certain traditions around most holidays. Easter – We always watch a VeggieTales Easter cartoon. My wife creates small chocolates that are placed in a small chocolate basket. We color eggs and have an egg hunt. 4th of July – We have a picnic before seeing fireworks. Thanksgiving – We always make pumpkin juice. Christmas – We always make gingerbread men. We also always have a special time where we set up a nativity and read the Christmas story. We watch a Charlie Brown Christmas Special. Birthdays – We wake the person up with a song we made up and dog pile him/her. We decorate the birthday person’s FACE with icing before having birthday cake. You might do some of these things in your family too, Why are they special then? These traditions are ways that our family connects and makes memories together. We think that even though not all the Weasleys seemed to enjoy their new sweaters, that they would be upset if they didn’t get one. It’s a tradition, and it helps to make Christmas feel special. Even though we have our tradition and spend time with each other connecting, there is still a sad point for all of our kids during any holiday or birthday. If you’re a foster/adopted kid, you probably experience this too. Even though you love your adopted/foster family, at some point when you are with your foster/adopted mom, you begin to think about your biological mom. My kids begin to wonder how it would be if their biological mom was laughing with them, making them a special cake, hugging them after opening presents, and so on. Harry experienced the same sadness. He saw his family in the mirror and wanted so bad for his mom to hold him. Call your biological mom and/or dad on a holiday (if possible). Tell your foster/adopted parent(s) that you need to talk about how sad you feel. Tell your foster/adopted parent(s) that you need a hug because you miss your biological family. Write down all the things you miss about your biological home. Draw a picture of things you remember doing at your biological home. 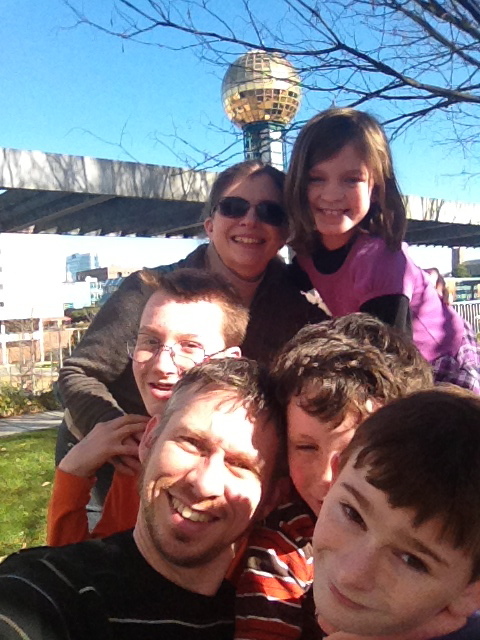 My kids all agreed that even though holidays are a ton of fun, missing your biological home hurts. It’s not bad to miss your biological home, and it’s good to talk about it. Missing your biological family during holidays is a normal part of an adopted/foster kid’s life, BUT you can get through it well with people who care for you. What traditions do you have? Do you have any suggestions for how foster/adopted children can deal with missing their biological families? Be sure to share your thoughts below. Your answers will help other kids and parents too. Are we the only ones that are upset with Malfoy? I mean it’s bad enough that Neville is having such a rough time at school without getting bullied by another Hogwarts student. We really wished that Neville could fly well also so that he was at least good at something. The big idea that we saw in this chapter was the idea of family. Harry Potter, Hermione Granger, Ron Weasley and Neville Longbottom are somewhat like a family at Hogwarts. Even at the beginning of the book, the students were told that their houses would be like a family to them while they were away from their real families. What makes them look like a family though? They teach each other new things (older students show the younger ones how to get around the castle). They try to help each other succeed. They try to earn their house points. There were a lot of times that the Gryffindors protected each other in this chapter. Harry and Ron confronted Malfoy in the Great Hall when Malfoy was picking on Neville and trying to take his remembrall. Harry flew the broom to stand up for Neville and get his stolen remembrall back from Malfoy. Hermione tried to stop Harry from flying the broom. She was concerned that Harry would be expelled and concerned that Gryffindor (her family) would lose house points. Hermione tried to stop Ron and Harry from sneaking out of the Gryffindor common room at night. She again didn’t want the boys to get into trouble and didn’t want her house to lose points. While Filch chased them in the hallways, Harry, Ron, Hermione and Neville all stuck together and helped each other get back to the common room. Protecting your family members can be a hard thing to do when you are a foster/adoptive child. For one reason sometimes past hurts make it hard to think about other people. One of my kids would agree that after being taken from their biological home, they worried about what would happen to themselves. 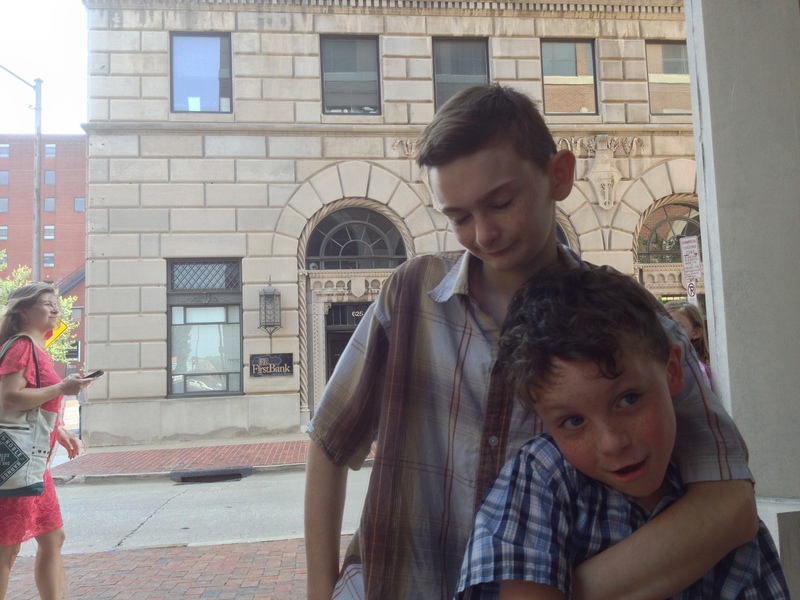 He just doesn’t worry about his adoptive brother getting bullied by other kids because he is more concerned about getting picked on himself. Our whole family actually had a talk after reading this chapter about what to do when your brother/sister is getting picked on by other neighborhood kids. We talked about how it is okay to tell a friend that you do not want to play or hang out with them if they are going to pick on your brother/sister. Family members protect each other and stick together. Friends might move away. My daughter and one of my sons would also say that as a foster/adoptive kid, it’s not always easy to stick together with your family. I can remember going to an amusement park and constantly having to tell one child to wait in line for rides with our family and not the people in front of us. When one child was very small, they would go to any man and call him “Daddy.” At church we had to make sure that this child went home with us and not someone else. It can be weird to stick together with your foster/adoptive family because you might not know them that well. A new foster/adoptive family are strangers when you first go to live with them. Like my kids always say to me – this is all normal, but you have to learn to trust the new family. It’s amazing to belong to a group, a family. When everyone sticks together and protects each other, you will feel more loved and the world isn’t AS scary. I like to remind my kids that we are proud of them. They could go to school and get picked on. They could go to a friend’s house and get made fun of, but we (their family) will always be proud of them and love them. It’s easier to face the world when you know that someone is proud of you no matter what. Would you have agreed to duel Malfoy? Why? Would you like to fly a broom? How does your family stick together? You’re hanging out with your friend in your neighborhood. Your friend begins to make fun of your brother/sister. What do you do? 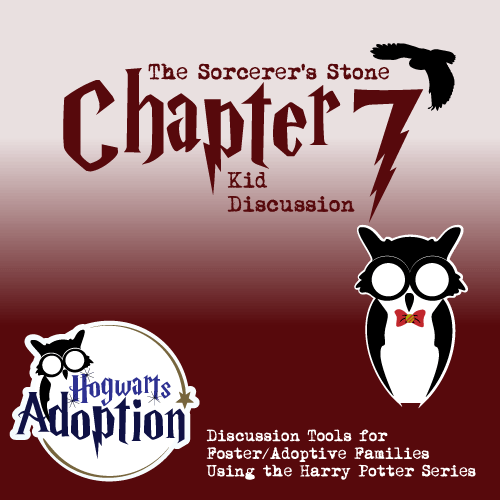 How should foster/adoptive families stick together? Do you have any ideas or thoughts about this chapter that you want to share with other kids? 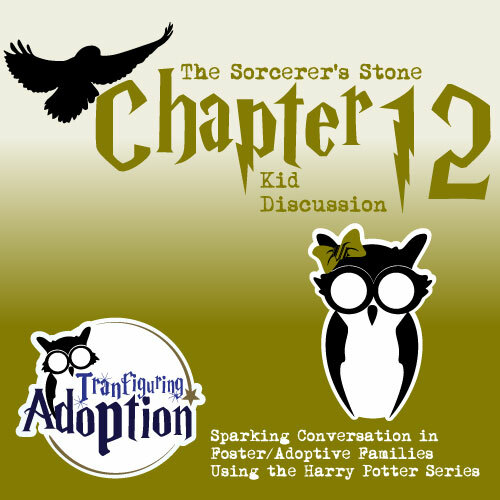 Chapter 7 – Kid Discussion – The First Night is the Scariest. Well we have finally made it inside Hogwarts and are ready to see what house Harry is sorted into. If you are like our family, we knew that Harry would not be sorted into Slytherin the whole time. We also were positive that Malfoy would be put into Slytherin house. My family also had a hard time figuring out which dessert we would most like to try at the feast. My vote was on the treacle tarts. It was my daughter who related best with this chapter even though all four kids agreed with her thought. She noticed that Harry had a bunch of fun at the feast and he was interested in meeting Nearly Headless Nick. He was loving the food and meeting new friends. Harry didn’t even seem to mind being put to bed. However, the night and the nightmare were not good at all. My daughter remembers the first few nights when she came to my home as a foster child. She remembers also that during the day she was very excited about all the new things in her life. She ran around the new house looking at new rooms and playing with the new pets. She looked through all the new toys in the toy room. She was even happy about being read new bedtime stories by her new foster mom in her new bed and sheets. The scary part came at night. All of a sudden she thought about all the bad things in her life. It was a difficult night for her. It was a night that she spent with the blanket wrapped around her whole body. Our older sons agreed that the first night was the most difficult in a new home. How do you make the first night better? Grab your teddy-bear — or stuffed animal or blanket that you like the most. It’s nice to have something that you care about in bed with you. Talk it out – If you think that you’re going to be scared at night, tell your foster/adoptive parents. They want to help you but they don’t know how unless you tell them you are scared. What house would you be sorted into? Brave Gryffindor? Clever Ravenclaw? Loyal Huffelpuff? Cunning Slytherin? What dessert would you like best at the feast? Have you ever had it? Do you think Ron or Hermoine were scared of sleeping at Hogwarts the first night? Why or why not? Does your foster/adoptive mom or dad remember being nervous at bedtime? Do you remember the first night at your foster/adoptive home? What was it like? Why do you think bedtime is so scary for some kids? for you? Comment below on what helps you not to be so scared at night time. What would help other adoptive/foster kids? As always we also we love to hear your thoughts and ideas from this chapter in the comments below.